Ecig More and more advanced,Have you tried to control your vape with voice? Do you want to have a try ? Here comes IJOY Avenger 270 234W Voice Control TC Box MOD With Dual 20700 it worth to have a try. IJOY always brings a surprise to its customers! 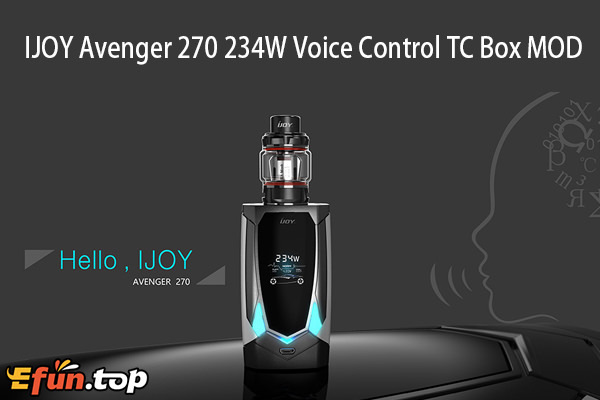 Allow us to introduce the latest IJOY Avenger 270 234W TC Kit to you! Powered by dual 20700/ 18650 battery, the IJOY Avenger 270 is a powerful and elegant TC MOD with 234W max output and innovative Voice Control System which makes the operation way easier than before. You can simply adjust the wattage or working mode by an interactive talk to your Avenger 270. Together with the high performance VW/ TC MOD and user friendly interface, the IJOY Avenger 270 234W MOD is definitely a good choice for cloud chasers! Two 3000mAh IJOY 20700 Batteries are included in the package.